As much fun as you can in the inter-tidal zone ! Climbing, scrambling, snorkelling, jumping and open water swimming all while navigating the coast! Great for building water confidence, pushing personal limits or as a team building experience. Even more of a buzz in surf! Safety is key to what we do, with clear communication in advance of entering our coasteer zones. Coasteering is a group activity and on every lesson we have two staff. 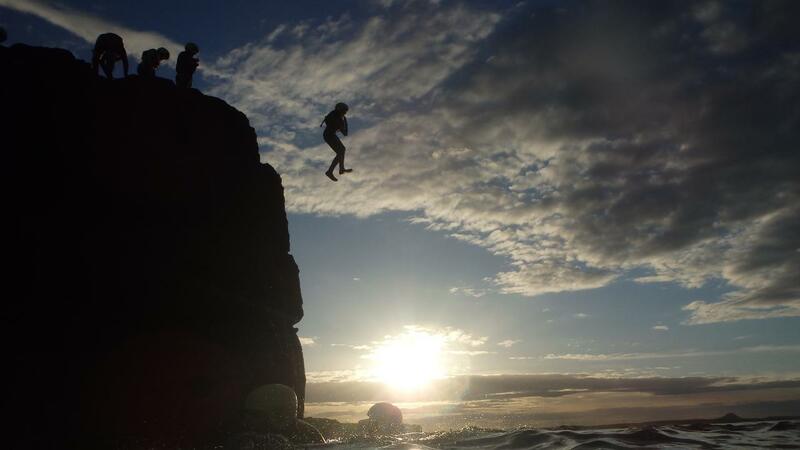 Coasteering is a fantastic way to see Dunbar's coastline and environment close up - the home of John Muir. All of our sports are weather dependent. If for any reason we cannot provide a safe coasteering lesson (surf too big), you will likely be offered an alternative activity such as surfing or bodyboarding, or the chance to re-schedule. You can assume everything is running as normal unless you hear from us before the lesson.